I got this product because I ride in a not so ideal terrain and I get tire flats most often than others and this 6-pack Procorsa CO2 cartridge helps me deal with flats. Because it is a threaded type, it is so easy to deploy and I am on my merry way sooner than later. I recommend this to all that commute daily. These cannisters were quite a bit shinier than Im used to. They also inflated my flat tire flawlessly. Great cartridge. Perfect size for road tires. well made CO2 cartridges. Reliable. What else can you say? Haven't had an opportunity yet to use them. Which is a good thing. Since I was going through several flats in a span few months last year, I decided to get a pack of cartridges instead just getting two for a better deal. Inflate the same as pricier brands. Good deal on a necessary consumable. Bought these for spare. Have not had the chance to use. But for the price it should be good to stock up just in caseI need to use. These are one of the best deals you can find on C02 cartridges. Especially when they are on sale. They work well, have good even threading and pump up a standard 25c road tire to over 100psi in seconds. Don't get caught out on the side of the road without them. I always have two in my pockets, along with two spare tubes. A very good price. Have not had to use any yet but that is a good thing. 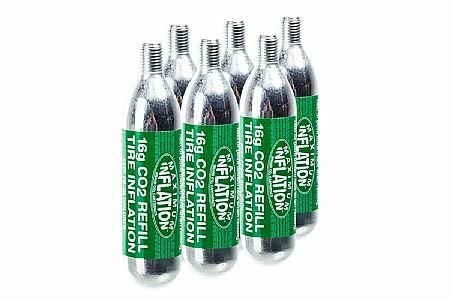 I don't seem to get too many flats, but I end up giving some other riders my co2 , so it's nice to have a stockpile.